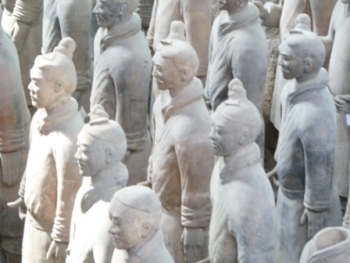 In Xi'an we saw the famous Terracotta Warriors. What a shock to see the HUGE building they were in! 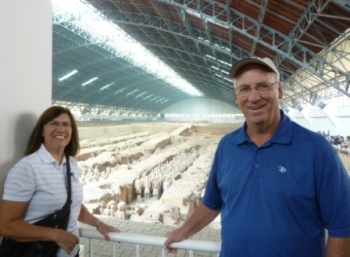 The arena-sized dome covered the actual ground where they were discovered. 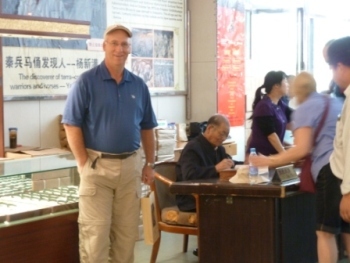 Plus it was a pleasant surprise to meet Yang Xin Man, who was the farmer/mayor of the village and the director of the well digging project when the warriors were found. We both shook his hand and he autographed a book for us. 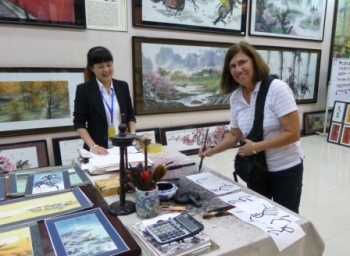 Afterwards, Vicki enjoyed learning how to write her name in Chinese characters at a calligraphy class. 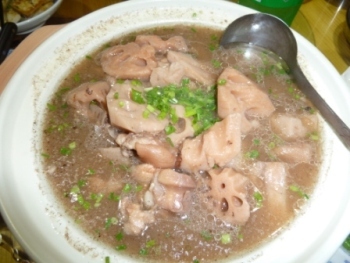 Our dinner in Wuhan, included the local delicacy - Lotus Root soup. 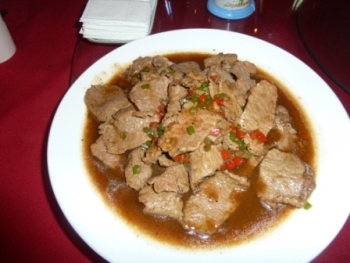 The tasty broth and chunks of lotus (which taste like boiled potatoes) was a favorite for our group. The riverside park was full of brides having their wedding pictures taken. 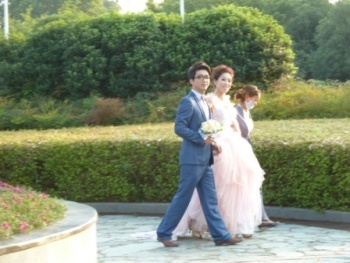 We saw at least 8 different girls wearing green, pink, red and blue gowns. White (the traditional color of death) is not a popular choice here. 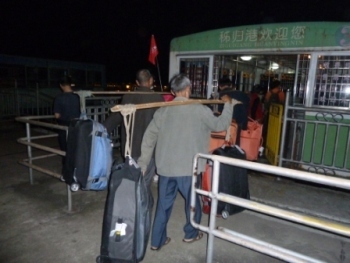 We knew we weren't boarding a typical cruise ship when these porters carried our luggage onto this "dandy", rust laden, crowded funicular that slid us down to our Yangtze River boat. 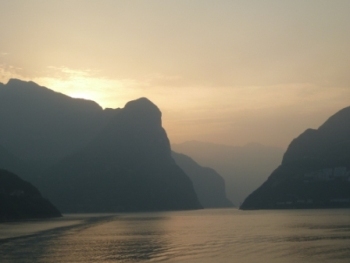 But we woke up the next morning to see this lovely sunrise as we passed through the Wu Gorge. 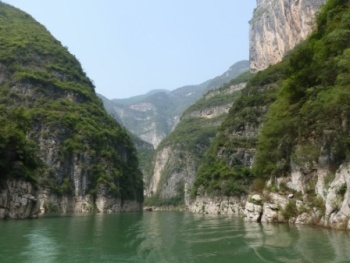 We left the cruise ship to sail in a small boat between the steep banks of the Goddess River Stream, a tributary of the Yangtze. 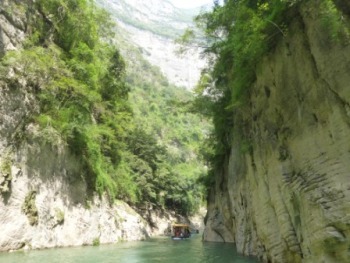 Can you see our tiny boat at the base of the mountain? With a closer view of the boat, you can't see the sky. 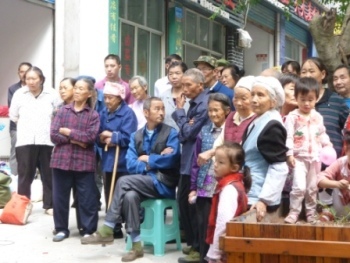 In Thongxian, one of our port stops we saw crowds of people watching the entertainment for a wedding. These were the singers they watched while family members stacked up a pile of wedding gifts - mostly comforters, towels and pillows. 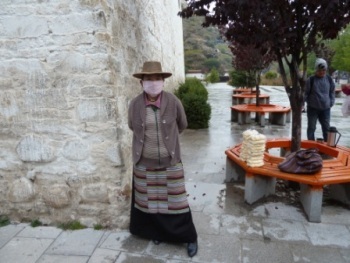 Our first morning in Lhasa, Tibet was tough. At 12,000 ft. it is one of the highest cities in the world. Four out of eight of us suffered from altitude sickness. Our hotel room had 2 oxygen tanks among the amenities (different than the gas masks we had seen in our China hotels). 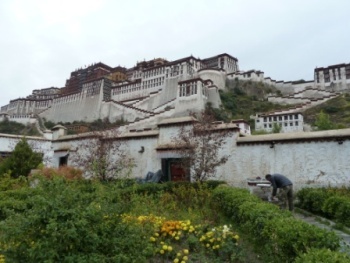 To top it off at 7:30AM in 42° weather, we waited to climb the 300 steps up to visit the Potala Palace, the winter home of the Dalai Lama. 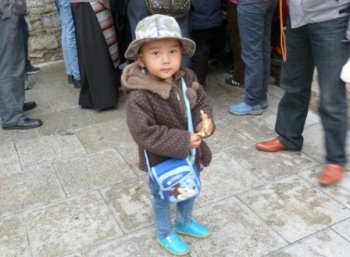 Waiting with us were pilgrims from all over Tibet and China, including this little cutey eating a yak sandwich. 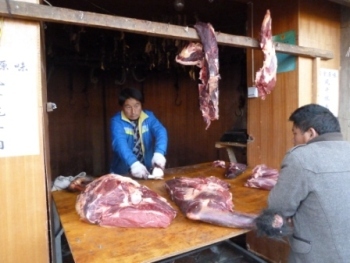 A woman stood nearby selling yak butter to the pilgrims. 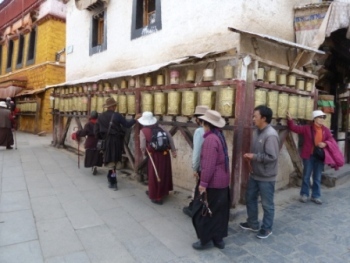 It is given to the monks inside to use as wax for burning candles. She is wearing a mask to protect her from sun and wind burn. Here the sky is beautifully clear and there is no pollution. Snow-capped mountains surround the city. 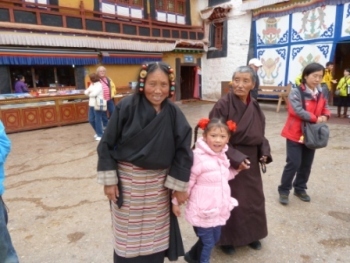 These palace visitors had come from far eastern Tibet. Wearing an apron indicates that the woman is married. 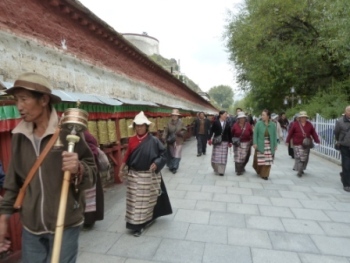 Many pilgrims walked around the entire "old town" while spinnning prayer wheels and holding a bead prayer chain to bring luck for their past, present and future. The cowboy hats that some farming men & women wear have given them the name of "yakboys". 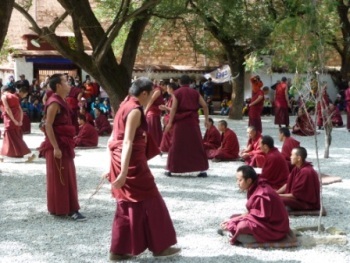 At the Sera Monastery, hundreds of monks underwent a "debate" which was actually a practice examination to move higher as a monk. The men holding chains of beads would clap their hands once for them to continue, but slap the back of their hands against their palm if they were wrong and admonish them to study more. Long lines of children waited to visit the monks in another building. These children had either had a nightmare or were trying to prevent one. 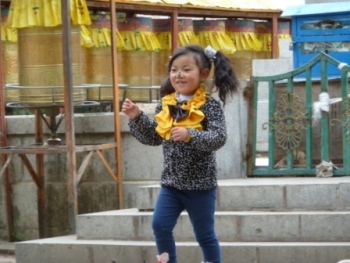 It is believed that beautiful children are visited by evil spirits, so the monks place a streak of charcoal on their noses to make them appear ugly. 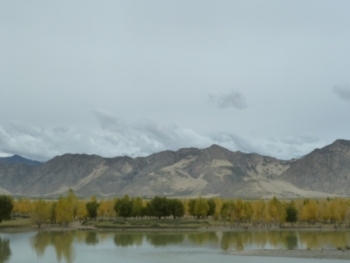 We left Lhasa and followed the willow tree lined Brahmaputra River up into the Himalayan Mountains. Along the way we saw herds of yak, rural villages and yellow fields of barley. 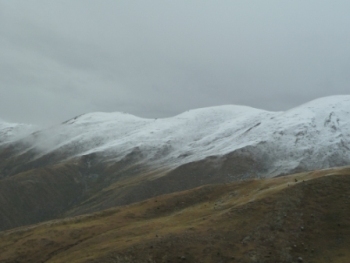 Near the top of the mountains it began to snow. 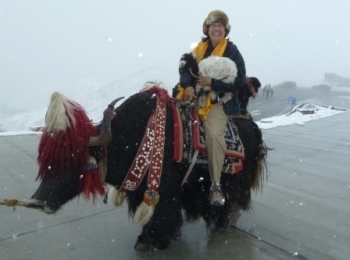 But that didn't stop Vicki from enjoying a yak ride while holding a baby goat near Jade Lake, the highest fresh water lake in the world. 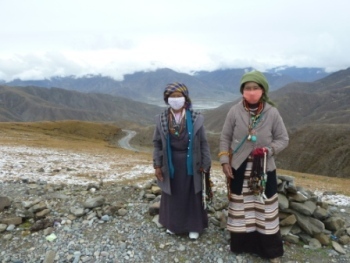 We stopped at this spot for a picnic and to enjoy the beauty of Khanbala Pass and these lovely women. 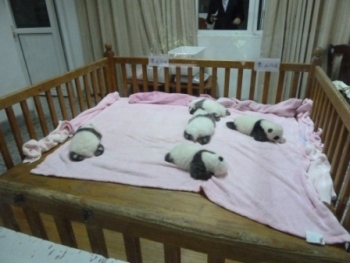 At the Panda Research & Breeding Center in Chengdu, China we saw a baby bed full of two month old panda cubs and nearby a one year old cub hugging his mother. 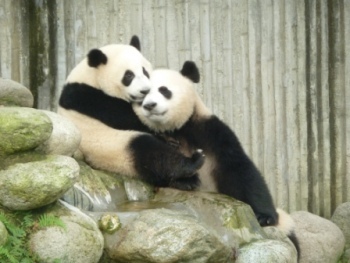 The botanical garden/zoo-like center is the home of over one hundred Giant Pandas. We had the opportunity to hold one ourselves for "only" a $300 donation, but we declined. 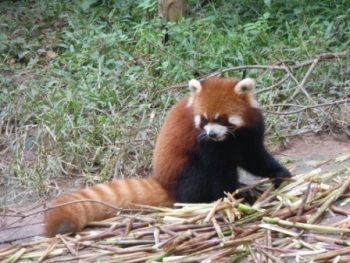 Red Pandas also live here and thankfully are not endangered. 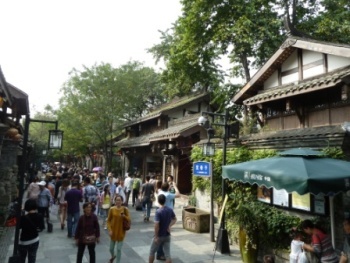 We spent the afternoon strolling through the streets and shops of Chengdu's Old Town area. 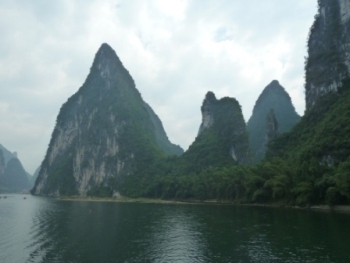 We had the perfect weather day to enjoy our 4 hour cruise on the Li River. 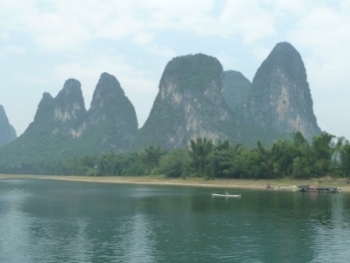 The limestone mountains had eroded into lovely formations that towered over the small sanpans and water buffalo along the banks. 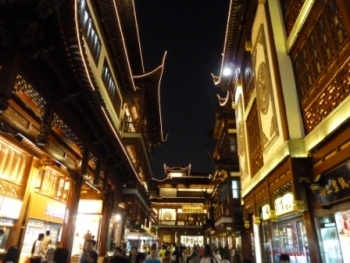 Shanghai had some wonderful night markets and the Yuyuan area was the place for pearls, teapots and silk. 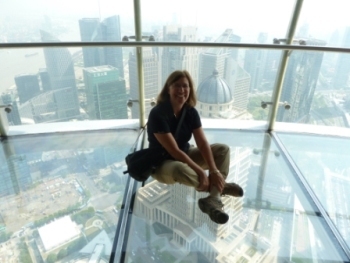 The Oriental Pearl Tower had a glass sky-walk that gave me the willies. Even though I knew it was strong, walking out on the glass while looking down was scary.